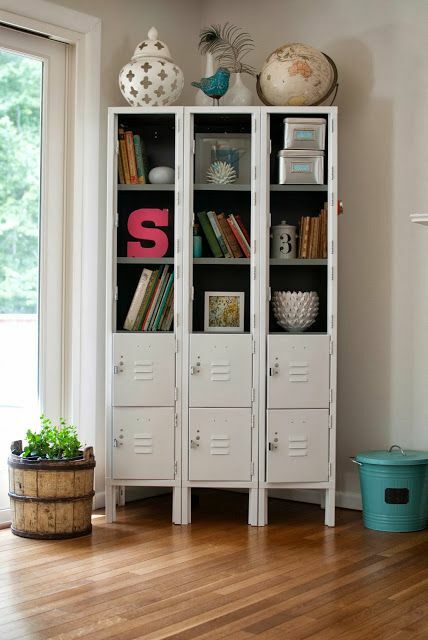 Craft room storage doesn’t have to be huge to be great! Hello to my fellow craft storage enthusiasts! It’s Hazel, all the way from currently not-so-sunny South Africa, and today I’m inviting you to join me on a tour of Vanessa Brady’s Teeny Tiny Craft Room. As my Craft Closet is very small, I tend to look in awe at crafters having even less space and making more with it. Vanessa Brady’s Teeny Tiny Craft Room is definitely fitting the bill!! That canned fruit wouldn’t have lasted in my Craft Closet! According to Vanessa, she lives in a sweet little house built in 1936 and, while that makes for great character, it doesn’t necessary mean a lot of space to work with. Just look at this slatted wood panel gifted from her sister. Supplies are added with hardware clips, the baskets for markers and pens are from Target‘s dollar section, and the baker’s twine is in an office in/out basket with some dowels strung across the openings. The washi tape is in a thrifted hanging wood basket – it fits absolutely perfectly! Everything is within easy reach and, as Vanessa says, what she lacks in space, she definitely makes up for in GREAT storage systems. I think it’s time for me and my Craft Closet to follow Vanessa’s advice and try to figure out better ways to store things and create more space. Who would have thought that an unused space off a pantry could become such a functional craft space? Hop over to Vanessa’s original post and read all the inside info. And while you’re there, remember to leave her some comments and thank her for sharing her space with us at Craft Storage Ideas. Have a wonderful week, and please check back as my fellow contributors and I have lots more to share right here on the Craft Storage Ideas blog. And please visit me on my blog as well – PlayAsYouGo! 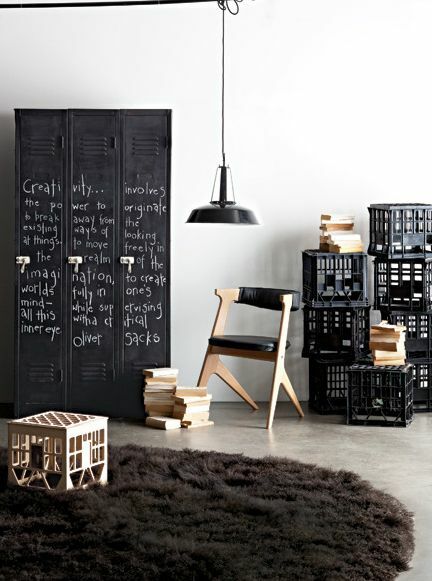 Love craft storage ideas and room tours like these? Hi dear readers! It’s Amanda here and I am super excited to share this wonderful craft studio with you today. Tracy Weinzapfel is an absolutely amazing artist! I’ve been following her blog and tuning in on Mixed Media Monday’s for some time now. Her artwork is just amazing! So lets take a look into her space where she creates her beautiful works of art. Tracy’s command central is this fantastic center island. Look at all those wonderful drawers! 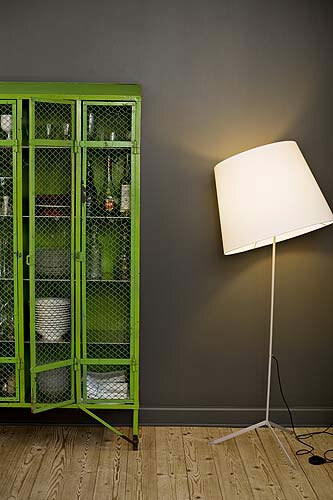 So much storage in one handy piece of furniture! On the table top she has a large piece of glass to protect the table top from paints. Not to mention… look at all those storage drawers in the background. Talk about taking advantage of every square inch! At one end of the room Tracy really has maximized her storage by using up all the vertical space right up to the ceiling. I love how she has her paint stored on the rails of the right wall. You can find more information about that genius storage solution here. Just outside the studio doors Tracy has these wonderful floating shelves to display recent works of art. How awesome is it to decorate with things you have created?! So cool! I just love this photo…. (*sigh*). Nuff said. Tracy is a wonderfully entertaining artist. She has regular videos sharing her Mixed Media Monday sessions where she paints live for an hour. Many viewers paint along with her and share their works on the facebook page. So make sure you hop on over to her blog and take a poke around. She creates some seriously awesome artwork. You can also view more photos of Tracy’s studio by following this handy-dandy link. 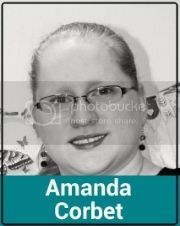 Hello everyone, it’s Suzanne here today from ScrapbookingSue.com. 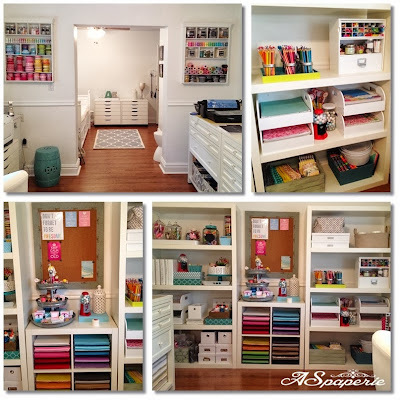 I have an amazing craft room to share with you today! Stacey, from A Sort of Fairy Tale/Cottage Industry, has allowed us to share her bright, colorful, and creative craft space. A beautiful mix of new and vintage pieces have been paired together to make a space so bright and cheerful, I would never want to leave if it were my room! Have a tour of the room below, and then pop on over to view more pictures at A Sort of Fairy Tale. To see what Stacey is up to now, please visit her new website, Cottage Industry. The majority of furniture in this room came from IKEA, including the colorful button rug. The iconic IKEA turquoise cart also has a home here, as it does in many of the craft rooms we feature here at CSI. A bright feature wall and vintage-inspired banner really add to the overall charm and elegance of the room. I love the vintage-colored suitcases and accessories! The collection of classic sewing patterns, books, and notions, complemented with the gingham-green table mat, takes me back to my grandmother’s sewing room. The pegboard offers ample storage space for accessories and display pieces. This shelf of vintage suitcases/trunks, and neatly organized bins and supplies is my favorite. 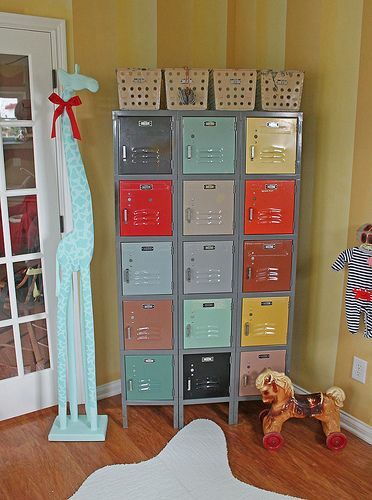 There is a ton of space to store your collection of sewing, scrapbooking, or general crafting supplies! It looks so neat and orderly, with everything in its place. Remember to visit A Sort of Fairy Tale for additional pictures and explanation of this room, and the new Cottage Industry website for more inspiration! Happy Friday fellow crafters! If you live in my neck of the woods then you might be digging out of a fresh pile of that white stuff we’ve been seeing all winter. I’m so ready for spring! So in the mean time I’ve been cleaning and organizing my craft room. I’m really trying to declutter and get rid of those items that have just been hanging around too long. You know, those “I could do this with that” items. It’s hard to let go of some of these items but it actually feels good to not be weighed down by them. 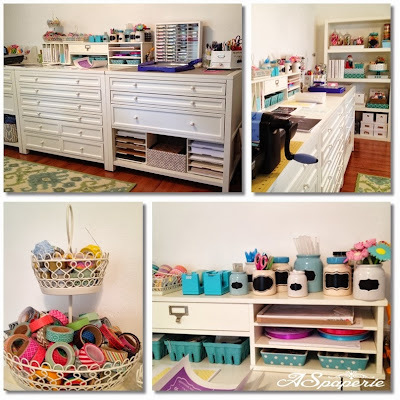 Moving on my post for you today is a quick tour of a beautifully organized craft room by Andrea on her blog Sweet Bambinos. She posted her newly organized craft room and I was drawn by the pops of color from all the crisp white. She uses a combination of Martha Stewart tables and Ikea bookshelves and drawer units to organize all her supplies. Here is the link to her original post sharing her room HERE and she has an updated post revealing what’s in her drawers and how they are organized HERE. Hello, it’s Suzanne here today from Scrapbooking Sue. I have something very exciting to show you today. We are going to step outside of the craft room, and take a look at some very daring DIY crafters that have taken a risk with their crafting spaces. All of the featured craft rooms are actually inside caravans/trailers! It doesn’t get much more Daring DIY than that! Take a look at the outside and a peek inside of each caravan below. There are plenty more pictures on each website, so make sure to follow the links. After researching this topic and seeing the stunning jobs these ladies have done with their crafty caravans, I have to admit that I am longing for one for myself! The caravan at Cassiefairy has been turned into sewing room storage. With vintage ice cream color decor and accessories, this sewing room is for the girly-girl in all of us. Just look at the Kelly Green exterior of the caravan at Happy Loves Rosie! I fell in love with it before I even saw the inside. There is definitely some creative process going on in the craft picture. This caravan is actually set up as a business, where crafting workshops are held. The Vintage Post holds classes like painting and bead work inside the caravan. 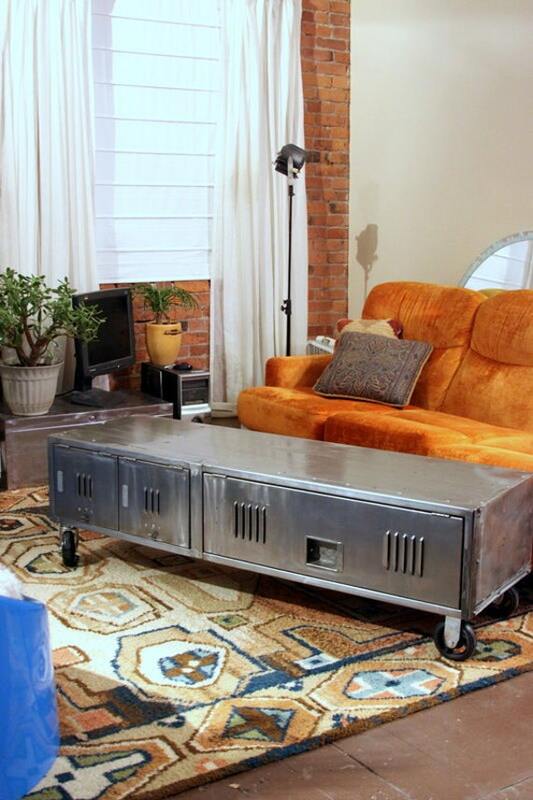 This beautiful trailer has been featured as one of our craft room tours here on CSI in the past. Becky Kay Designs has converted a large trailer into a crafting paradise! Yet another entrepreneurial crafting spirit, the Crafty Camper is a mobile workshop and market. The inside of this camper is absolutely stunning! I am in love with the vintage colors, accessories, and how everything was staged for the pictures. Whether you call them caravans, trailers, or campers, these mobile beauties are just perfect for converting into craft rooms! Have you ever considered a DIY project this daring?